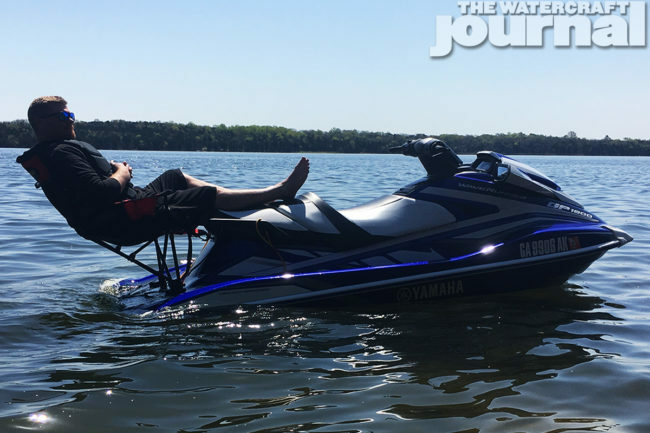 The Watercraft Journal’s 2018 Top 10 Christmas Gifts For Jet Skiers | The Watercraft Journal | the best resource for JetSki, WaveRunner, and SeaDoo enthusiasts and most popular Personal WaterCraft site in the world! What is happening these days? Folks are putting up Christmas decorations even before Thanksgiving comes around. We can maybe be OK with putting up lights and wreaths on Black Friday while the rest of the family is out brawling for a smokin’ deal on a flat screen TV, but the week before Thanksgiving? C’mon folks. Enough is enough. And since there’s still plenty of time left before the 25th for shopping, we’ve listed ten of our favorite products that we’ve seen and/or reviewed this year. 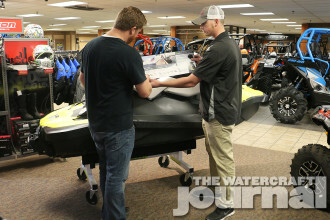 And yeah, we get it; not everything is the “perfect fit” for everybody; and that’s OK. We think a lot of these items will be exactly what the avid jet skier in your life – or you yourself – will love. And we suppose that’s the joy of this sport. So many different kinds of people can enjoy it in their own way. And while we’re certainly considering both price and usefulness, the real value that we wanted to focus on was value and innovation. 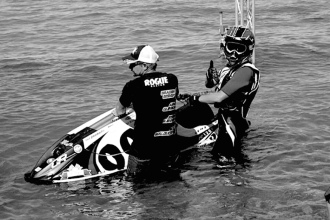 So again, as you’re eking out the last minutes of the shopping season for the jet ski lover in your life, see if any of these would make a great gift for the holiday season! Inexplicably, what should be the single-most no-duh product on the market – Bopenski Watersports’ Kickback PWC Chair – seems to be the most hotly contested. Yes, the as-listed price of $219 on Bopenski’s own website makes a few folks’ toes curl, but now with special pricing through RIVA Racing and Watercraft Superstore, you can hack that price by nearly $45! Yup, you’ve read that right. Easily the most-overbuilt folding chair the world has ever seen is now available through two of the largest aftermarket product vendors in the industry! And yes, it really is that good. Made from anodized and powder coated aluminum and stainless steel, the frame is as rugged as you can imagine, with the perforated mesh seat being double layered and heavy stitched to last a long, long time. For you outdoorsy types, this folding chair is 100-percent on par with the nicest camping and collapsible hunting chairs that you see at Cabella’s or Bass Pro Shops for double the price of the Kickback. 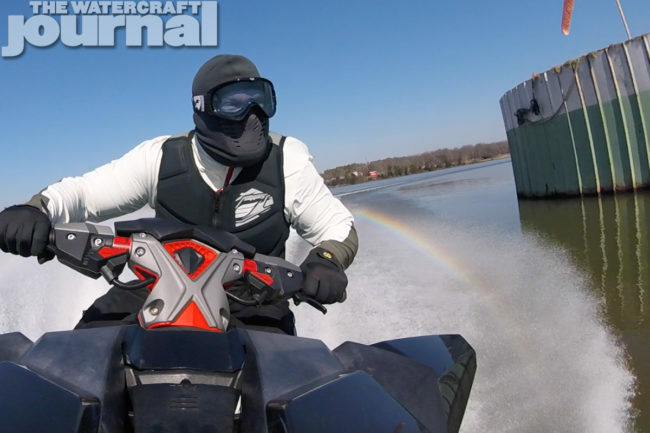 The new 2018 Sea-Doo RXT-X 300 beckoned performance enthusiasts like a moth to a flame, drawing guys with itchy throttle fingers in droves to grab the new supercharged powerhouse. The unusual ST3-hull features a very unusual mix of flat surfaces running from sharply-angled chines that blend into large, flat-bottomed shelves flanking the craft. While it gives the new runabout its exemplary stability, it accounts for its tendency to turn flat, and lose predictable tracking and handling in rough seas. 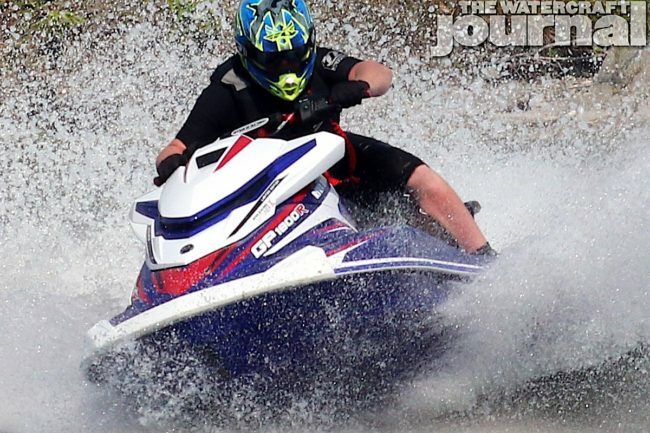 To directly counter this, The Watercraft Journal studiously researched, tested and evaluated RIVA Racing’s Pro-Series Sponsons for the 2018 Sea-Doo RXT-X 300 as not only being merely beneficial but transformative. 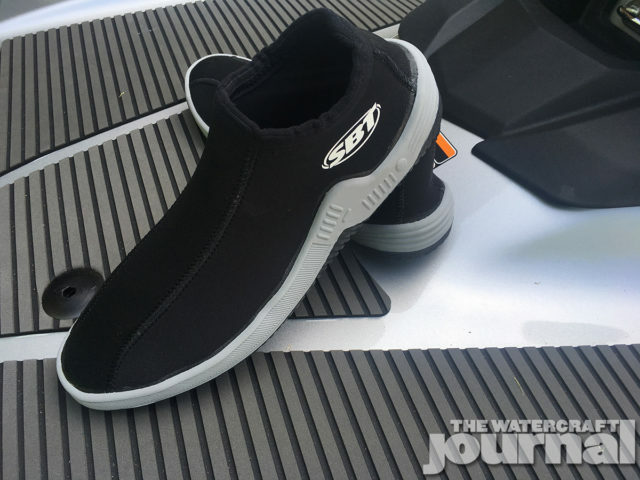 Frankly put, if you’re doing anything more than wave jumping, your new Sea-Doo RXT-X 300 needs these. Placing the trim attitude forward on the ST3’s nose, while keeping a long enough blade in back to keep the tail from breaking loose in the corners (we suggest the #4 position), the RIVA Pro-Series Sponsons literally transform the overall handling and dramatically increases our total enjoyment of this machine. Seriously, if you’ve got a 2018 RXT-X 300, buy these. Do it now. OK, this is more of a Christmas decoration that would be an actual gift – unless of course, you were trying to help a loved one spruce up their holiday cheer. Although we failed to find the Hydro-Turf Christmas Tree listed anywhere on Hydro-Turf’s proper website, we did spot a few trees still available over at N&C Jet Ski Ltd. The Wallasey shop (just north of New Brighton) have a few of the first run of Hydro-Turf Christmas trees still in stock – but they’re going quick! And yes, the trees come with multicolored tabs acting as ornaments and even a Christmas star topper! 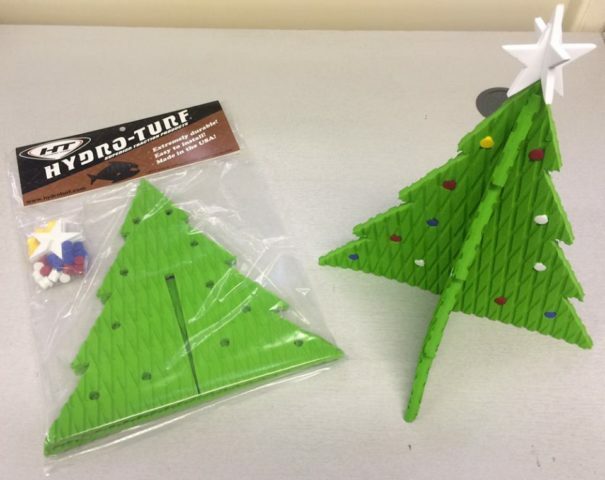 The Hydro-Turf Christmas tree is a fun addition to your shop, showroom or even home. Priced at £14.95 (about $19.50 USD), it’s a fun bit of holiday decoration you’ll come to love. While many of you won’t dare brave the chilly weather and have dutifully packed your PWC in for a long winter’s nap, we at The Watercraft Journal and many, many more never say die (because Goonies never say die!). And that means you gotta get properly equipped to ride, or you won’t survive for very long. It was by mere happenstance that we stumbled across the TLK Windproof Cycling Face Mask. At the time we ordered and reviewed it, the TLK was priced a bit over $25. Today, it’s under $20 – a killer price considering how well-made it is. And what exactly makes it so great? Glad you asked! We reviewed the TLK Face Mask earlier in the year during a particularly nasty cold snap; it dutifully protected our ears, nose and mouth from wind chill, is cut long so you can tuck it into your collar, and the eyelit is comfortably cut small enough to fit inside of a pair of goggles. No wind, no water, no problem. There are certainly quite a few sunglasses manufacturers offering floating options. Unfortunately, designers are content with simply gluing on a few patches of lighter-than-water foam to the frame and call it a day. While yes, they do float, these are often uncomfortable, bulky and far less than attractive. That’s why we like what WindRider has done with its Polarized Floating Sunglasses. These smooth, angular frames wrap around your eyeline with nary a patch of Hydro-Turf in sight. Rather, the foam is smartly integrated into the frame’s hydroformed, injection-molded sides – leaving only a good looking pair of sunglasses. Equally, the WindRiders also are smartly shaped to not only fit your face comfortably, but in a way to keep them from flying off while at speed. Many folks can’t stand the incessant flapping of a lanyard against their neck, so too often glasses are lost at the bottom of the lake or ocean. 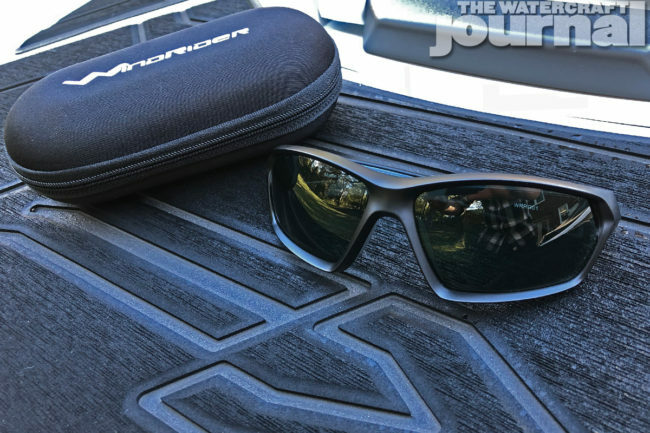 WindRider designed their glasses with wind relief cutouts, allowing air to diffuse, eliminating lift and reducing the threat of being whipped off. It’s been a really long time since we’ve found a pair of sunglasses that do everything right, and the WindRiders are exactly that. While the WindRiders still don’t appear on WindRider’s website, they are listed on eBay and Amazon. Many casual riders will brush off the idea of wearing a full lace-up boot, particularly when the skies are clear and the sun is warm. But we find even on low-key cruises, added traction and superior protection is never out of style, and that’s where a good pair of riding boots come in real handy. 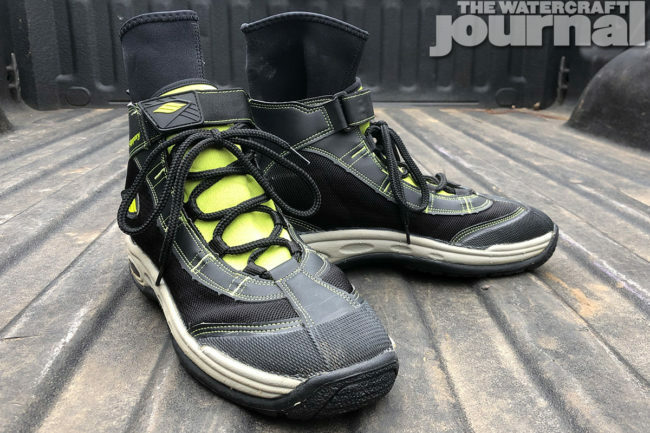 While we’ve found more gimmicky boots offering more frills and snazzier options, Slippery Wetsuits’ Liquid Race Boot has never, ever let us down. Now on our second pair in 13 years, our first pair of Liquid Race Boots were just getting a little stiff after too many years of use. Thankfully, the updates and improvements made to the boot were made to the toe and heel, reinforcing them with thick, textured panels giving added traction and protection to an already stout product. Riders and racers who use them love the Liquid Race Boot from Slippery, and we’re certain you will too. 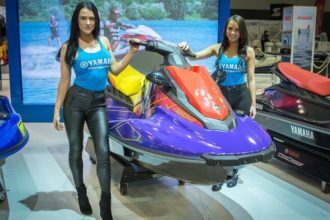 Mainly overshadowed by the all-new Fish Pro and stunning red, gold and stealth-black RXT-X 300, one of the biggest additions for the 2019 Sea-Doo lineup was the inclusion of BRP’s universal LinQ accessory system on all runabouts – not just the ST3-based machines, but the GTIs, and even the Sparks! That, and Sea-Doo added another two items to its already impressive catalog of LinQ accessories: the LinQ cooler, the LinQ fuel caddy, LinQ bag, and now two more storage bags (a rigid storage bag, and a soft-sided dry bag). 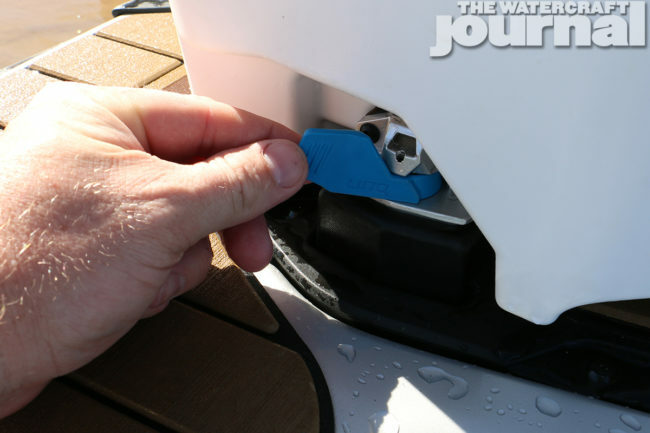 Moreover, the new LinQ brackets can be installed on the entirety of Sea-Doo’s lineup (and other brands’ PWC if you’ve got the inclination), so these items can go on anything anywhere you choose to go! At first glance, including a bottle of restoration polish might seem a little misplaced. 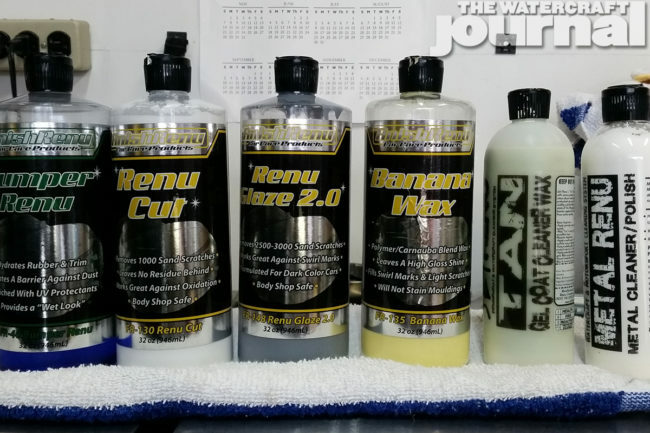 But knowing that Finish Renu is the parent company of Jet Renu, specifically targeted for professional detailers and service departments, including the Renu Glaze 2.0 starts to make more sense. The medium synthetic compound is formulated to effectively remove 2500-to-3000 grit scratches and other surface imperfections such as swirl marks and hazing, which for many who have older or heavier-used watercraft, happens to be a life-saver. In our experience, we found using a Porter Cable orbital buffing machine with an orange light cutting foam pad (working the surface in a cross-section pattern a small section at a time, and removing the haze using a micro fiber towel from each section before moving on to the next) works wonders. See how well we did in this before-and-after test here. Coming in behind our suggested Liquid Race Boot from Slippery is SBT Racing’s Hydro Shoe. These lightweight one-step slippers are a great item to keep more or less permanently in the storage bin of your PWC. Every now and again, we find ourselves ill-equipped for a rocky shore or pebbled beach wishing for some footwear superior to our flipflops – and that’s where SBT’s Hydro Shoes come in. We’ve had a couple of pairs over the years and find ourselves wearing more often than we’d expect. They’re a handy bit of footwear that quickly dries in the sun, and rarely fails – although they do tend to discolor if left out in the elements or in a poorly ventilated area for too long. The soles are moderately cushioned and the added grip is always welcome, and the neoprene neck breathes well, so that you’re foot isn’t a waterlogged prune when you slip them off. And for a little over $20 bucks, how can you say no? OK, to be fair, you probably can’t get one of these hot mamas. No, not because coughing up a stiff $26k for the PWC-equivalent of a fully operational Death Star is out of your price range (no way, Jose! RIVA Motorsports can help you finance that bad boy). Nope! It’s because RIVA only cranks out 25 of these hand-assembled machines. That’s right! RIVA’s team of professional wrenches tune each specifically-numbered machine, guaranteeing a blistering 86mph (at 8,600rpm) from a true 350-flywheel horsepower. And yes, we know first hand because we rode the snot out of one. Each Limited Edition is strapped with a massive grocery list of go-fast parts, including a RIVA MaptunerX Yamaha License, RIVA SVHO Power Cooler Kit, a RIVA/HKS Yamaha Power Cooler SSQV Blow-off Valve, an RIVA Yamaha GP1800 Power Filter Kit, a RIVA Engine Breather Upgrade Kit 1.8L, RIVA’s SVHO Intake Manifold Upgrade Kit, a RIVA Valve Retainer Upgrade Kit, a RIVA Pro Series Engine Cooling Upgrade Kit, a RIVA SVHO Supercharger Shaft Upgrade Kit, and a RIVA High Flow Billet Fuel Rail. 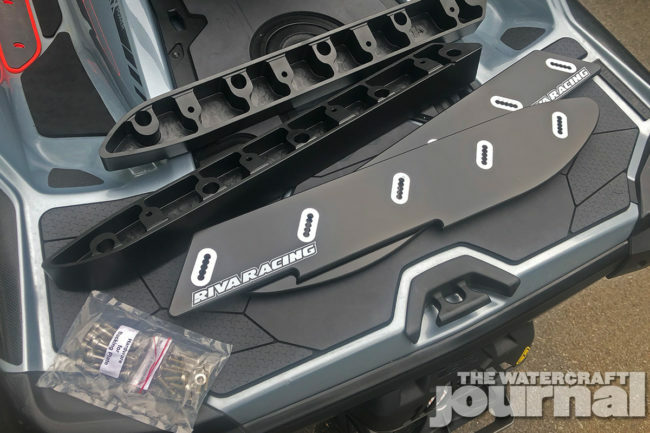 This list continues with a RIVA GP1800 Rear Exhaust Kit, a RIVA Yamaha GP1800/VXR/VXS Performance Ride Plate, RIVA Yamaha GP1800/VXR/VXS Top-Loader Intake Grate, RIVA Yamaha GP1800 Pump Seal Kit, and a RIVA Yamaha GP1800/VX Pro Series Sponsons; a Solas 160mm Concord 13/20 Impeller, RIVA Yamaha GP1800/VXR/VXS Pro-Series Steering System, a RIVA Pro-Bar 32-inch Runabout Bar and a pair of ODI Ruffian Lock-On Grips. They also include a RIVA Limited Edition Rear Traction Mat, a RIVA Limited Edition Seat Cover and of course, the RIVA Limited Edition Graphics Package.